In this age of “environmental awareness,” it’s no real surprise that even funeral arrangements are going green. In fact, the idea seems to be picking up steam, thanks to recent stories in the media, including a feature article in the New York Times. But what does that even mean? How can you possibly have a green funeral? There is no clear-cut answer, no single plan that makes a funeral green – but that’s the beauty of it. Just as any efforts to create a sustainable lifestyle are unique and personal to that individual, so is a green funeral. You can go all out with a burial pod, or make a few changes, such as a living urn, so that the process is more earth friendly. It’s all up to you. As more people become interested in reducing their carbon footprint and turn their attention to lifestyle practices that are kinder to the environment, green burial is on the rise. In fact, a survey by the National Funeral Directors Association showed that 72% of cemeteries report experiencing an increase in the demand for green products and services relating to end-of-life arrangements. This interest has resulted in a number of companies updating their product and service offerings to include those that are sustainable. There have also been quite a few companies launched in an effort to meet the growing need of green funeral products such as biodegradable caskets. Cemeteries are also answering the call, allowing green burials on their property. 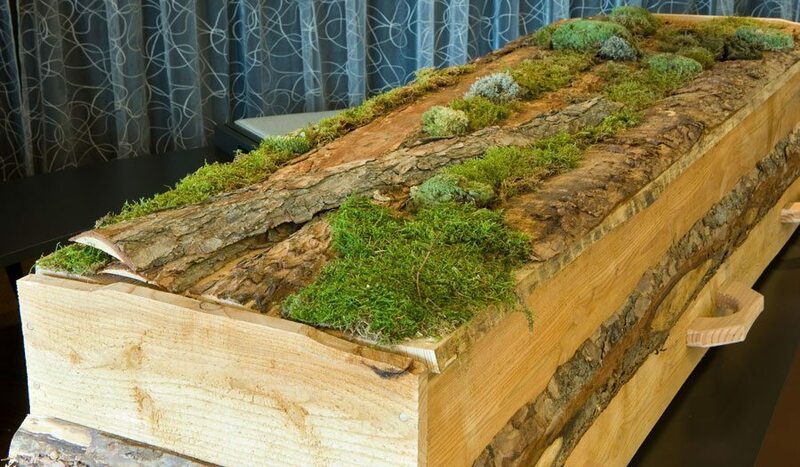 The term “green funeral” actually encompasses more than just the funeral service. It covers every stage of burial or cremation and can include the choice not to embalm, choosing a biodegradable urn or casket, saying no to concrete grave vaults, and anything else that protects the environment and minimizes human impact. An individual can choose what they want throughout the process, going with as much or as little to incorporate into their own service. The primary goal is to reduce waste and keep that carbon footprint as small as possible. Any option that feeds the environment is particularly attractive. Planning your final arrangements is a very personal thing. The truth of the matter is, you can go as green as you want. There are many options that you can choose. For most people, the primary determining factors are the impact it has on the environment, cost, and the legacy they leave behind. Many choose to go green because it is something that they believe in. Embalming – or lack thereof in a green funeral – is a point of interest for a number of people who are exploring earth-friendly burials. What they often don’t know is that embalming is not a legal requirement when a person dies. People are usually embalmed as a cosmetic measure, so that they look more “normal” or natural during the wake or viewing. It does little else, and there are some religions that do not embalm their dead. Biodegradable caskets and urns are another item of interest. The body or cremains are placed in the object, it is buried, and it begins to break down over time until it is absorbed back into the earth. Some forego the casket and just use a shroud made from natural fibers like cotton. There are also special containers that hold cremains and they are used to nourish a tree or plants. It not only gives back to the earth; it allows the person to live on.If you would like to know more about green funerals, you can download our e-book. It covers what you need to know about planning and preparation, but if you have any questions, you can always give us a call and get the answers you need.